Russia Direct’s new monthly memo outlines both the risks and opportunities that closer political and economic ties with China pose for Russia. Amidst the heated debates about the future of Russia-China collaboration, Russia Direct has released a new monthly memo - “Russia reorients to the Orient” - that describe the implications of collaboration between Moscow and Beijing for the world. 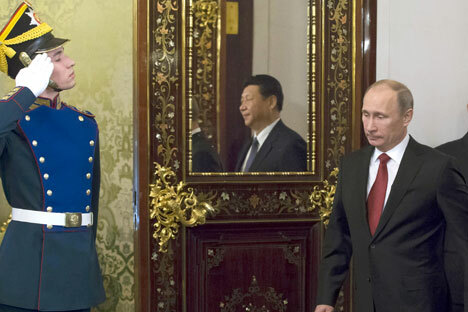 The report presents several scenarios for the development of the Russia-China relationship. At the same time, the report clarifies how recent economic developments – like the $400 billion gas deal between Gazprom and China National Petrolium Corporation (CNPC) – will impact Russian foreign policy in the Asia-Pacific region. “For both Russia and the West, economic growth in China is the key to resolving a number of long-term domestic growth issues,” wrote the author of the report Vassily Kashin, Senior Research Fellow at the Moscow-based Center for Analysis of Strategies and Technologies. Kashin points to the Ukrainian crisis that, according to him, has significantly catalyzed Russia-China economic and political collaboration. In the report, Kashin describes in detail different aspects of Russia-China collaboration, including the energy deal between Gazprom and CNPC, bilateral military-technical cooperation, joint initiatives in space exploration and aviation as well as energy infrastructure projects such as the “Power of Siberia” gas pipeline, through which Russian gas will flow to China and which costs $70 billion ($20 billion more than the Sochi Olympics). What specific opportunities and challenges does China present for Russia? What will dominate in Moscow-Beijing collaboration in the future: rivalry or partnership? Will two geostrategic rivals be able to find common ground? Subscribe and download the full version of the report to find out.